What are the top causes of preventable death in every stage of life? The answer may surprise you. Accidental injury has become the No. 3 cause of death for the first time in U.S. history. Injury statistics examined by NSC data experts confirm that preventable deaths rose 10% in 2016. Based on new injury statistics, an American is accidentally injured every second and killed every three minutes by a preventable event – a drug overdose, a vehicle crash, a fall, a drowning or another preventable incident. A total of 14,803 more people died accidentally in 2016 than in 2015, the largest single-year percent rise since 1936. New information is being added to the website continuously, and stay tuned for new categories, including international and state-specific data. 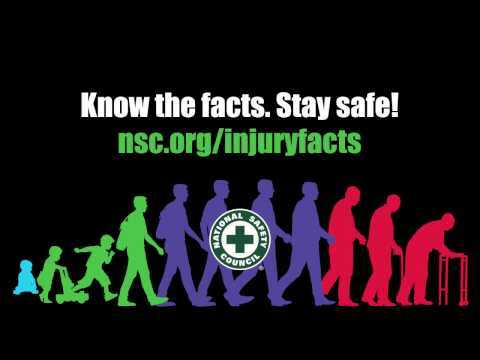 Injury statistics provided in Injury Facts, published since 1903 and now for the first time online, help people understand what their greatest risks are. Our complacency has resulted in 442 deaths each day, every one of them preventable. We know what to do to save lives, but collectively we have failed to prioritize safety. NSC encourages Americans to understand their risks. Unintentional poisoning deaths in the adult population were not prevalent until the early 1990s. Since then this category has skyrocketed to first place, driven by unintentional drug overdose predominantly from prescription painkillers. Learn more. The Odds of Dying chart, based on Injury Facts data, helps us assess the biggest risks we face. Solve your safety challenges, reduce injuries, improve efficiency, boost morale and create a culture of safety. We follow the data so we know where we’ve been and where we’re headed.